CAUTION Be careful not to burn yourself. The engine oil may be hot. CAUTION Be sure to remove any old gasket material remaining on the sealing surface of the engine. 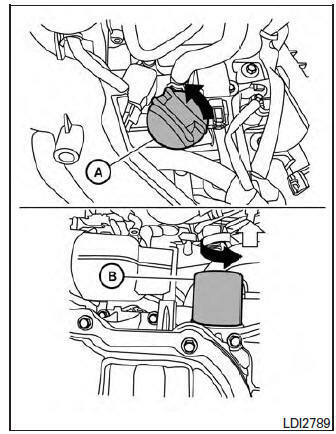 Failure to do so could lead to engine damage. Coat the gasket on the new filter with clean engine oil . Turn the engine off and wait more than 10 minutes. Check the oil level. Add engine oil by removing the oil filler cap A if necessary.